Today AAA unveiled North America's first roadside assistance truck capable of recharging electric vehicles. They are ready to come to the rescue of its members with 'depleted' batteries and provide Level 2 or Level 3 charging at roadside. "AAA has been a leader in addressing the needs of motorists for more than a century, and the introduction of mobile electric vehicle charging continues that tradition," said Marshall L. Doney, AAA Automotive Vice President. "As the electric vehicle market continues to emerge, AAA is ready to help alleviate some 'range anxiety' with the ability to provide a charge to electric vehicles on the roadside that gets drivers back on the go quickly." During a news conference at the Plug-In 2011 Conference & Exposition, AAA announced it initially will deploy the trucks with mobile electric vehicle charging capability in six metropolitan areas across the U.S. as a pilot program, including Portland (Ore.), Seattle, the San Francisco Bay area, Los Angeles, Knoxville (Tenn.) and the Tampa Bay area. The phased rollout will begin later this summer and continue into the fall. "While these six areas are part of the initial pilot program, we've had tremendous interest from AAA clubs across the country to offer this service to their members, and we anticipate expanding the program to additional areas in the months following initial deployment," said John Nielsen, AAA Director of Auto Repair, Buying Services and Consumer Information during a news conference at Plug-In 2011. The vehicles are equipped with various technologies to provide mobile charging capabilities as part of a previously announced evaluation in six test cities around the country. The AAA Roadside Assistance truck unveiled at Plug-In 2011 is powered by Green Charge Networks, featuring a removable lithium-ion battery pack for mobile charging. Other vehicles will be equipped with generators powered by alternative fuels or other power sources. The truck is remarkably similar to AAA's other light services vehicles — in contrast to some charging vehicles recently unveiled in other countries. Officials demonstrated the truck is equipped to allow AAA's technicians to provide roadside assistance to all motorists, including battery testing, jump starts and replacements, tire changes, fuel delivery and locked car entry. 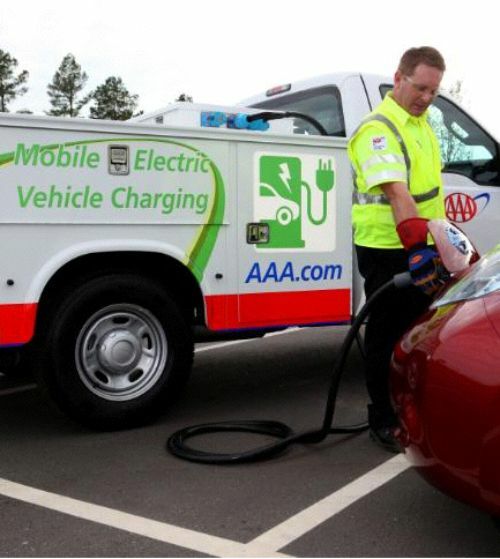 "AAA's mobile electric vehicle charging is intended to be a service similar to what AAA has provided to motorists with gas-powered vehicles for nearly a century. When your vehicle runs out of fuel — whether it is traditional gasoline or electric 'fuel' — AAA can provide you with a limited amount to help you safely reach a location where you can fill up your tank or your battery," explained Nielsen. AAA is wiling to provide 10 to 15 minutes of charging to members with depleted EVs, allowing vehicles to drive three to 15 miles to where they can further charge their vehicle. The intial Nissan Leafs and Chevrolet Volts were delivered to customers in December 2010, and automakers expect production b to hit combined 40,000 vehicles by year’s end. An additional 145,000 units are expect to sell during 2012 and projections have 1.2 million electric vehicles on the road by 2015. Level 1 is a standard 120-volt household outlet, which would take roughly 20 hours to fully charge a Nissan Leaf. Level 2 is 240 volts AC (alternating current). This is commonly found in household electric clothes dryers and can charge a Nissan Leaf in approximately six hours. Level 3 is DC (direct current) charging at high voltage—up to 500 volts DC. This allows a large amount of energy to be delivered to an electric vehicle in a very short period of time. A "depleted" Nissan Leaf could go to 80 percent state-of-charge in roughly 30 minutes with Level 3 charging. AAA’s mobile EV charging vehicles can provide Level 3 and Level 2 to electric vehicles. The company is stepping up its existing hybrid vehicle training to include EVs and developing specific equipment training for technicians operating their Mobile Electric Vehicle Charging units. During President Obama's State of the Union address last January, he outlined the intent to have one million electric vehicles on the road by 2015. Google has recently announced its studies show with advancements in battery technology, electric vehicles and hybrids could reach 90 percent market penetration by 2030. Policy initiatives have been instituted to boost sales of EVs via federal consumer tax credit through the American Recovery and Reinvestment Act of up to $7,500. In addition, almost 40 states and D.C. have adopted measures promoting EV purchase including HOV privileges, waived emissions inspections and tax credits or rebates. Don, what percentage of these AAA trucks are full electric plug-ins themselves? It's not crystal clear, unless I missed it. It seems ironic that gasoline or alternate fuels are the primary source instead of full electric for these "other vehicles". Then again, the generators providing the 480V power to recharge the stranded vehicles would have to run on something other than electric, unless the battery providing the recharge is gigantic. Will you please clarify? And correct me if my assumption is wrong.